Sparsely vegetated beachfront land remains between 47th and 48th streets Sept. 19 after it was cleared for development. 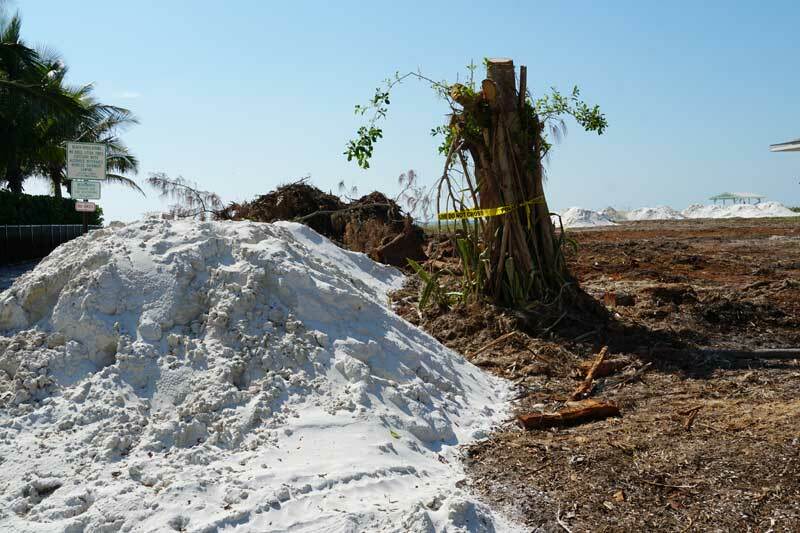 Trees whacked and sand piles on beachfront property in Holmes Beach are creating a ruckus. 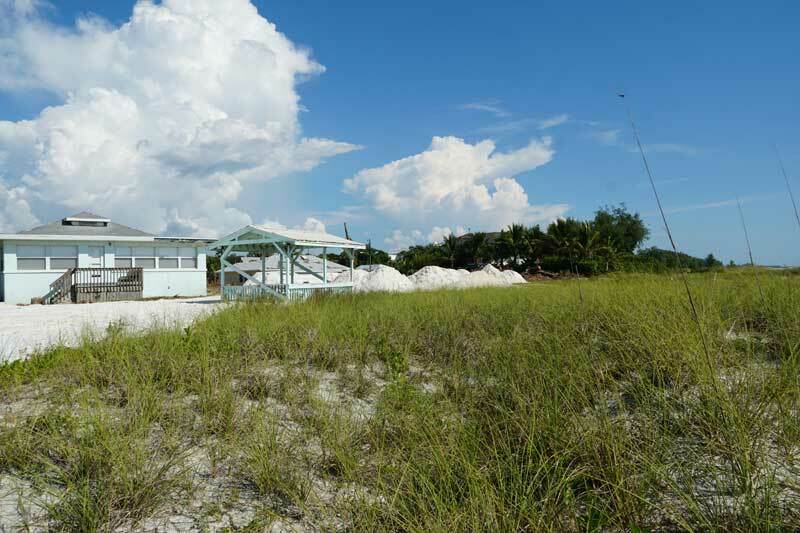 A permit was issued Sept. 10 by the Florida Department of Environmental Protection to builder/developer Shawn Kaleta authorizing the addition of sand seaward of the coastal construction control line on the parcels at 47th and 48th streets, according to DEP spokesperson Shannon Herbon. 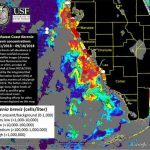 “This was verified when an inspector drove by the site Sept. 11 and the sand had not yet been spread,” wrote Herbon in a Sept. 18 email to The Islander. 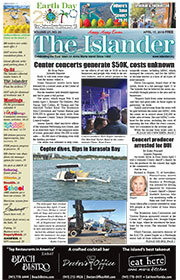 Herbon said the permit was issued in advance, not after-the-fact, as Holmes Beach Commission Chair Judy Titsworth claimed in the Sept. 19 story in The Islander. The land had been cleared six days earlier, leaving the controversy over a permit — or no permit — unresolved. 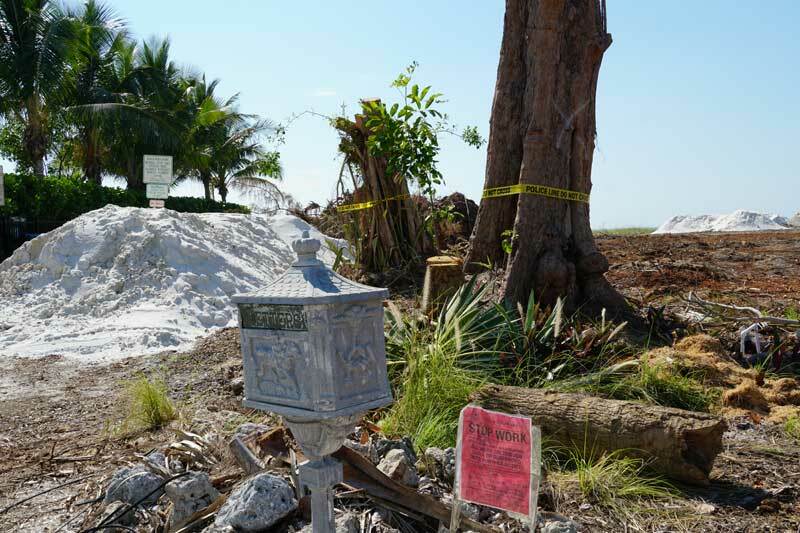 As of Sept. 21, the sand remained in piles, with city stop orders in place. The block of beachfront property was stripped of vegetation, mostly Australian pines — an invasive species not protected by environmental rules — but questions include whether a beach access was impacted. At the city meeting earlier in September, Titsworth accused Kaleta of failing to abide by environmental rules in clearing city property and called for commission and mayoral support to rein in the developer. The DEP permit issued to Kaleta as an agent for the owner limits the developer to 200 cubic yards of sand — the equivalent of 17 10-wheeler dump trucks of sand — for placement landward of a seawall. Kaleta and wife Jennifer co-own a home at 102 48th St., one of the properties listed on the DEP permit. 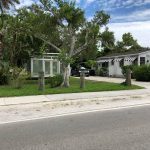 Two other properties listed on the permit are 101 48th St., owned in a trust for Lawrence Peter Repar of Tampa and 4700 Fourth Ave., owned by Fourty Seven Street LLC. Four days before the DEP permit was issued, Holmes Beach building official Jim McGuinness issued stop work orders for “landscaping, excavation, fill, destruction of coastal buffers without authorization.” to 101 and 102 48th, as well as 102 47th St., owned by Fourty Seven Street. The developer and his attorney oppose the city stop-work orders. “The owner and contractor have the DEP permit for this work and the police department also requested the removal,” Kaleta’s attorney, Louis Najmy, of Najmy Thompson law firm, said Sept. 19 in a text message to The Islander. 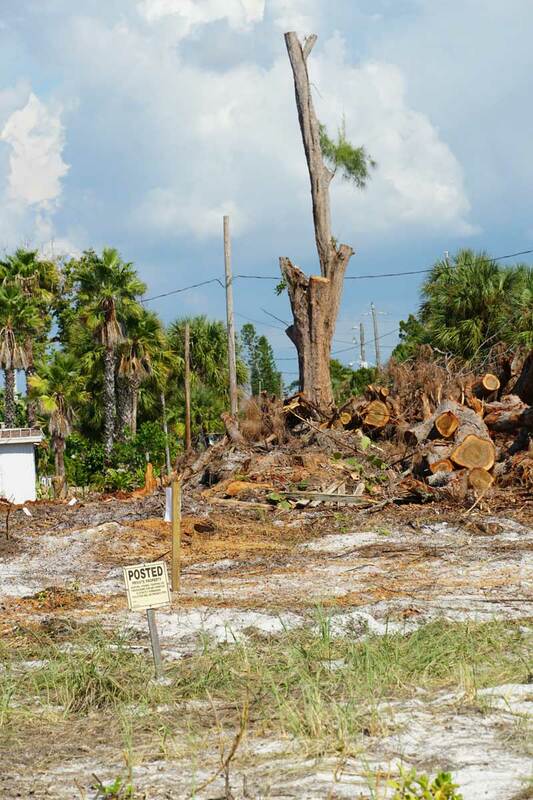 With no permit needed for the removal of the Australian pines, Najmy said the only property at issue is 4700 Fourth Ave.
Najmy and Kaleta say the city is attempting to generate false hype against the developer. They took umbrage with Titsworth labeling the developer a “repeat offender” due to work on 77th Street in 2017 at the Sept. 13 city meeting. Kaleta was cleared of wrongdoing regarding the landscaping work that was red-tagged on 77th Street. Mayor Bob Johnson expects the city and DEP to meet about the red-tagged properties. He said Sept. 19 the building department is working to determine whether the developer’s work went beyond any city ordinances, as well as the permit.